3. Double click on the downloaded extension and you’ll get a prompt asking if you want to install it – click that you do want to. 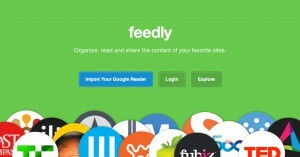 There’s the Feedly button. Click on it and you start the process of importing your Google Reader feed into Safari! Sorry, what? So I have a shortcut to the website now in my toolbar? What about adding feeds? That shortcut, when clicked has the ‘Add content’ option…. Ah so the extension is simply a shortcut to the feedly website. Not quite what I had hoped for. Hope they bring out something more useful!